In the last year there has been a sharp increase in the volume of counterfeit tobacco in Russia, including incidents of illegal supplies of cigarettes from China. Experts believe that this unexpected phenomenon is due to restrictions on tobacco sales. However, despite this initiative, the total number of smokers in the country remains practically unchanged. Russia is facing a growing problem preventing pirated tobacco from reaching its domestic market, with the volume of counterfeit cigarettes rising sharply in the last year, including several incidents in which illegal supplies of cigarettes were found to have originated in China. 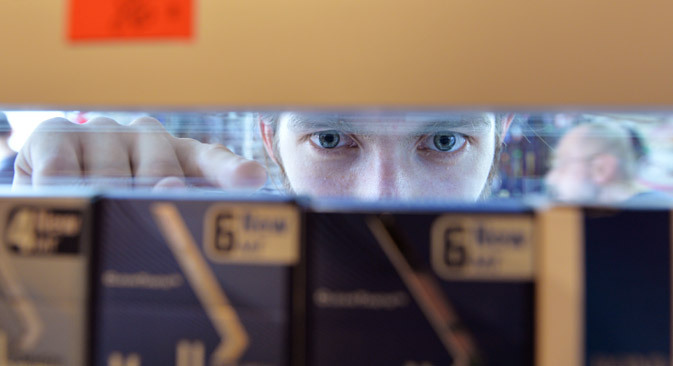 Sergei Kiselyov, Vice President of Corporate Affaires and Communications at Japan Tobacco International (JTI), told RBTH that one of the reasons for the growth of counterfeit tobacco is the ban on the open display of cigarettes in stores. Moreover, according to JTI, the substantial growth of counterfeit tobacco is also conditioned by the growth of excise rates. According to Kiselyov, Chinese production constitutes just 1 percent of counterfeit tobacco in Russia, since until recently Chinese tobacco was shipped to Western Europe, where prices are significantly higher than in Russia. However the growth in excise duty means that Russia has also become an interesting market for illegal producers. The remaining 99 percent of counterfeit tobacco in Russia is produced internally and in Ukraine. In June 2014 the Russian government introduced a ban on the open display of cigarettes in stores: Since then it has been prohibited to put cigarettes in display cases. "On the whole, the introduction of the ban on open display probably went against the interests of the government and the consumer," said Kiselyov, who explained that now it is difficult for the consumer to identify if they are buying a legal or counterfeit product. Timur Nigmatullin, an analyst from Moscow-based investment company Finam Holdings, confirmed that the share of counterfeit tobacco in Russia has grown substantially in recent years. However, he also noted that this is related to a decrease in the population's real income because people are trying to save money on tobacco products. A survey by global market research firm TNS shows that in the course of the six months after the ban went into effect in June 2014 the amount of counterfeit tobacco on display grew by 60 percent and the share of cheap contraband products from neighboring countries increased by 25 percent. The TNS press office said that in the last five years the volume of illegal trade had increased by 14 times from 0.1 percent in 2010 to 1.4 percent at the end of 2014. "As a result the federal budget is suffering: Last year the government coffers did not receive 21 billion rubles ($365.25 million)," explained Kiselyov. He added that the accepted amendments to the 2015 federal budget confirm the expected reduction of planned revenues from tobacco excise to be 35 billion rubles ($608.76 million) by the end of the year. Despite the ban, the number of smokers in Russia has barely changed. "As in other countries that had introduced a ban on the open display of cigarettes, the Russian ban also did not result in a significant effect on smoking prevalence," said Kiselyov. According to an IPSOS survey, after the ban was introduced the general number of smokers in Russia in 2014 decreased to 36.8 percent from 37.4 percent of Russian adults the previous year. A WCIOM survey shows that in 2014 the number of smokers decreased by only 1 percent, from 35 to 34 percent of the adult population. The 2014 ban on openly displaying cigarettes was accompanied by a ban on smoking in public places. The press office of the Russian Federation of Restaurateurs and Hoteliers told RBTH that in the first month of the ban alone, restaurants' commodity turnover decreased by an average of 25 percent and in six months many eateries saw a 15- to 35-percent decline in revenues. Furthermore, the volume of the tobacco market also contracted. According to Philip Morris, in the January-June 2015 period the Russian tobacco market shrank by 6.5 percent, with the figure predicted to be 8 to 10 percent by the end of the year.